The largest and most affordable Online Seatpost Steco Pin-Up Shop! Seatpost Steco Pin-Up shop the largest and most affordable! Do you want to buy a Steco Pin-Up Seatpost online? Hollandbikeshop.com has the Steco Pin-Up Seatposts you're looking for. Starting in 1928, Steco has been fascinated with metal and the way useful, intelligent solutions can make life a little easier. That's why Steco products are reliable and clever, including seatposts by Steco. Looking for a Steco Pin-Up Seatpost? At Hollandbikeshop.com you can find a wide choice of Steco Pin-Up Seatposts. In our wide range of Bicycle Saddles & Seatposts on Hollandbikeshop.com you can find Pin-Up Seatposts by Steco in different thicknesses, like for example 25 mm. So you'll surely find the Seatpost Steco Pin-Up you're looking for! 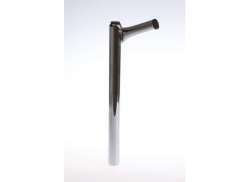 Hollandbikeshop.com is dealer of Steco Pin-Up Seatposts and has a large and affordable range. We also often have Steco Pin-Up Seatposts on sale or in our outlet, so keep an eye on our sale button. The largest and most affordable online Steco Pin-Up Seatposts shop!